I always wondered why the public pool at Webber had such a high wall. Going there was like stepping back in time. The pool was crazy-busy with kids, and the high walls and high-ceilinged changing and shower areas echoed with all the happy screams. Thanks for your memories, Wendy. 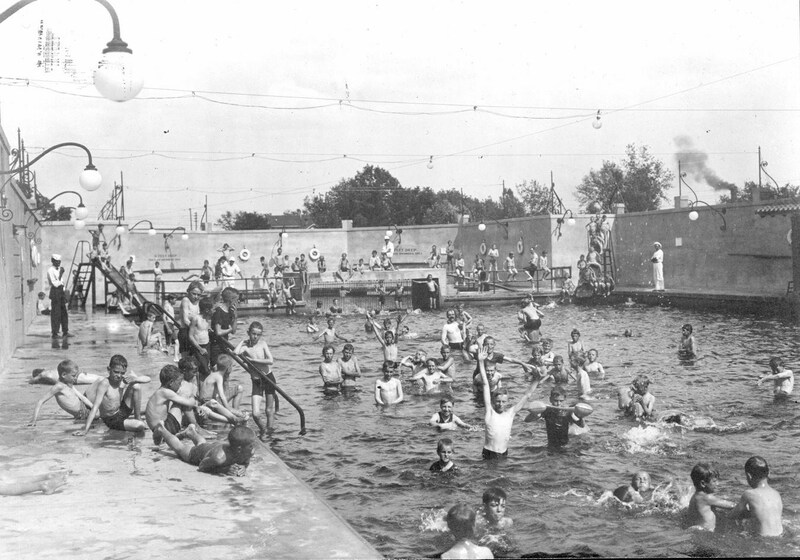 Webber Pool had to be one of most-loved park structures ever built. I talk to so many people who have such fond memories of the place. I don’t see the “Nine-foot pool,” with diving boards and a diving tower. Anyone know when that was added? Although the “waterfall,” which was on the east end of the “Nine-foot pool,” is shown in a position that appears to be at the end of the pool that was five feet deep. The lifeguard stands were in the middle of where the fence railing is shown. Thanks for the question, John, I don’t know the answer. Anyone? I’ll try to find more info. The John Deere Webber Baths was named in memory of the son of Charles C. and Mary Harris Webber, who donated the money to build the swimming pool and community center in what was then Camden Park in 1909. The Webber’s son had died at the age of 9. Charles Webber was the grandson of John Deere, the tractor and plow maker, and ran the Minneapolis branch of the John Deere Company. The Webbers also paid for a renovation of the park facilities in 1927. From the time of its construction until the 1927 renovation the swimming pool was filled with water from Shingle Creek. After that city water was used instead of creek water, which had become increasingly polluted. Camden Park was renamed Webber Park in 1939.